Boardgame made of wood, Size approx. 200 x 40 cm with extra compartment to store the gaming pieces. Includes 30 gaming pieces made of wood (diameter approx. 51mm). With the special vault the gaming pieces have a good sliding manner. Triple glued ground of teak-coloured wood, massive varnished sidebars made of nature beech wood. Screwed Cross connections under the Shuffleboard made of beechwood. Approx. 2m long and approx. 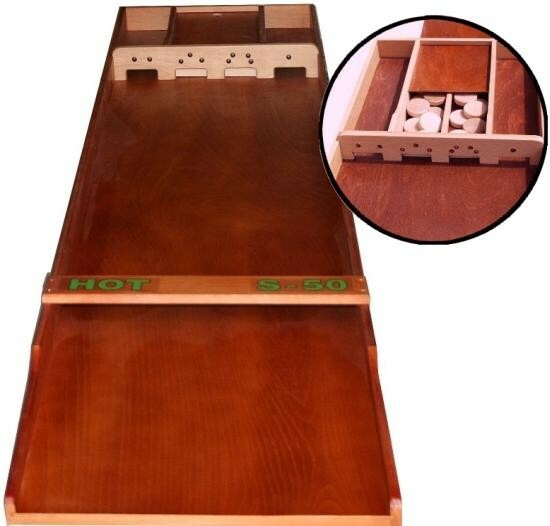 40 cm wide game board with 4 aims with different valuations. Try to shoot the gaming pieces into the aim-boxes. If a gaming piece remains lying before the aim-boxes you can sink it with the following gaming pieces into them. A funny game for every age.